Description: this flute sword is made from brass or stainless steel and the blade is made from hand forged damascus steel that can be used for real combatting or cutting purpose, good for self-defence. if you want them blunt, leave us a message. 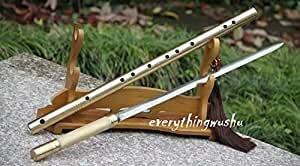 So choose what you want…this flute can be used for a musical instrument..
so it is both used as a real sword and real instrument. The nice tassle is included!